Texas Governor Gregg Abbott is asking citizens to wear blue on Friday to honor law enforcement officers. Wearing blue on Friday is part of Abbott’s call to honor law enforcement officers on the day slain Harris County Sheriff’s Deputy Darren Goforth is laid to rest. 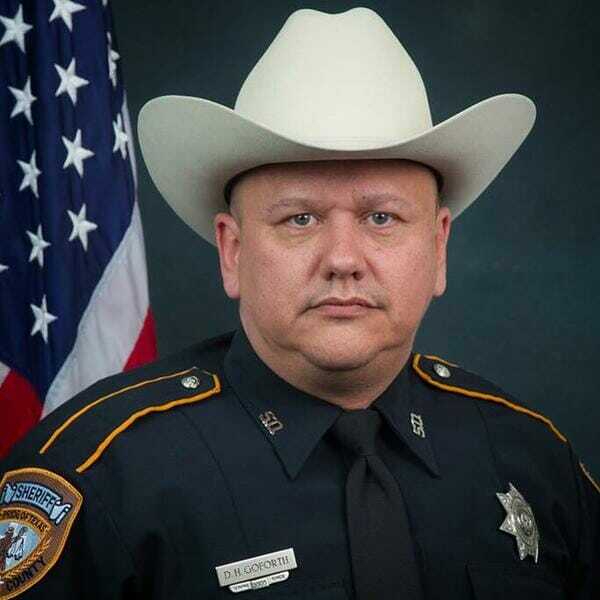 Deputy Goforth was on duty and in uniform when he was shot to death at a gas station last Friday night by a man who came up behind him and fired fifteen bullets in to the unsuspecting deputy. Abbott is also asking Texans to turn on their vehicle lights for one minute at 11 a.m. CDT and for law enforcement officers to turn on their red and blue lights at that time which is when the funeral for Deputy Goforth is scheduled to begin. Abbott issued the call to wear blue on Friday on Twitter and at a speech in Houston Thursday. Abbott issued an order Thursday that flags in Texas be lowered to half-staff in honor of Deputy Goforth. The text of Abbot’s statement is below. “Governor Greg Abbott today ordered Texas flags across the state to be lowered to half-staff on Friday, September 4th, the day of Harris County Deputy Sheriff Darren Goforth’s funeral. Today’s order follows Governor Abbott’s call for law enforcement officers across the state to honor Deputy Goforth and all those who wear the uniform by activating their red and blue lights for one minute at 11 AM Friday, the moment Deputy Goforth’s memorial service in Houston is set to begin.